Concerning crafts and lacquer, I have a favorite project of mine to share with you today. I love it because a) it is quite easy and b) I am totally delighted with my result! I have spent the last five years in Freiburg, a city right on the edge of the black forest. So when I moved away, I wanted to create a keepsake to honor that time. 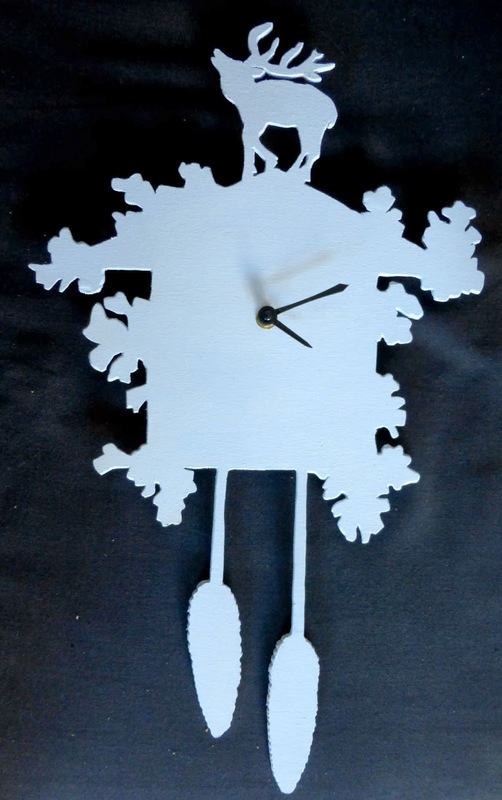 The choice of a cuckoo clock was quite easy, as there is little as connected to the black forest as that ticking bird´s home. 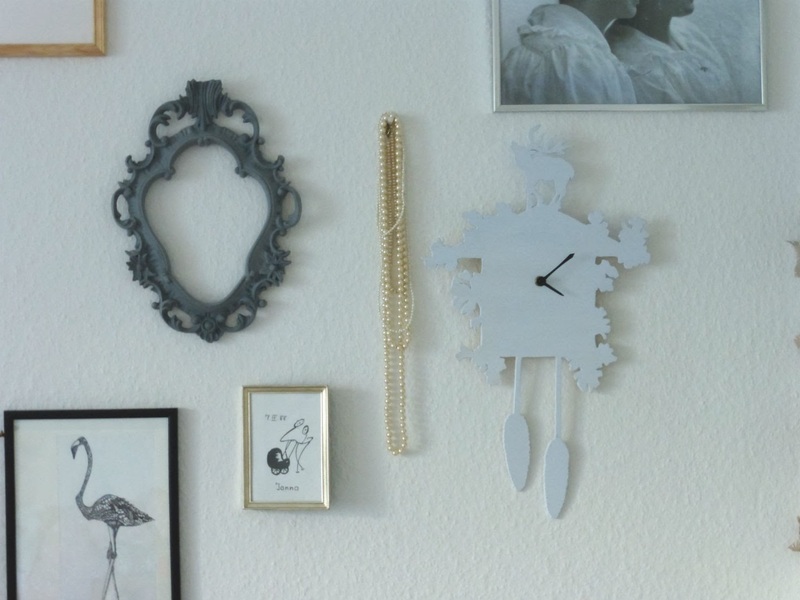 I actually owned a traditional cuckoo clock when I was small, but my taste has changed some and I did not want all that dark wood and tons of curlicues to clutter my room. They sell a modern version that is just a silhouette painted in all imaginable colors (pink seems to be a customers favorite). But as I did not want to drop 40 € on that, I decided to do it myself, which is more fun anyway. clock". I did not like the designs on top of the clocks I found, so I searched for a picture of a roaring stag and put that on top of mine. 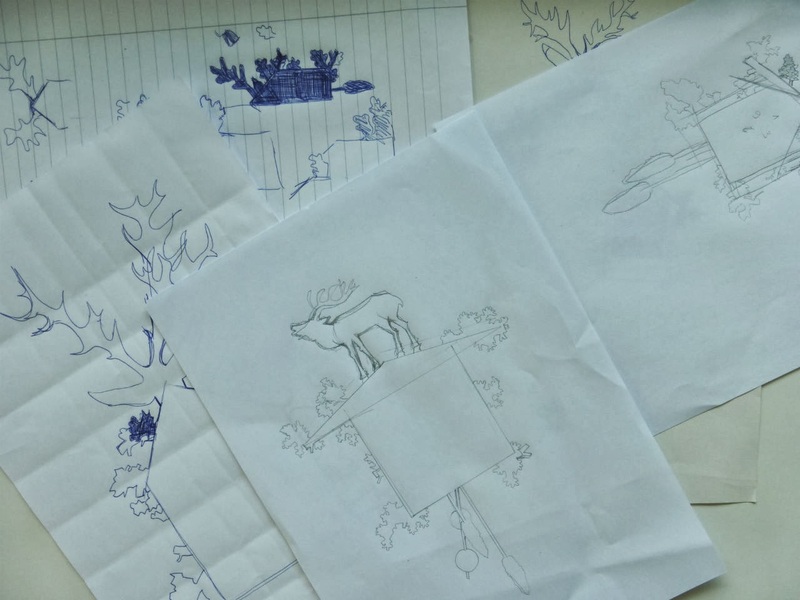 As you can see left, I did a lot of sketches to get a silhouette I really liked, but that is not necessary. 2. 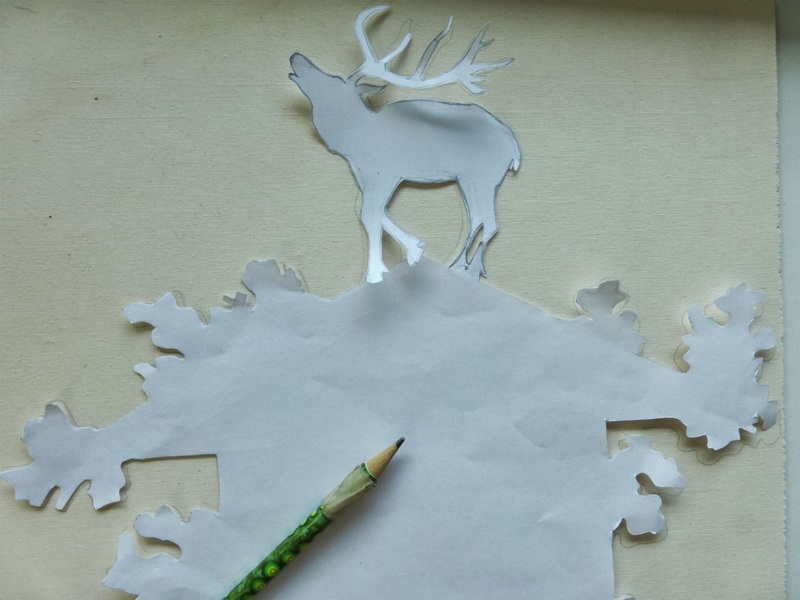 Enlarge the silhouette to the size you want and cut it out. Put it on top of the plywood and trace it. 3. Do your sawing. If you need to cut out some internal pieces (like between the stag´s legs) first drill a hole, than enter your saw blade. 4. Sand down the edges. 5. Mark the middle of the clock and drill a hole for the clockwork. 7. Enter your clockwork and set the watch. This is a project for one afternoon, with great results. Be sure to try it out, even if you did not live in the black forest! OH WOW! You are absolutely amazing! Great job on this super cuckoo clock! I really love the modern ones! Well this is just incredible - really !!! What a gorgeous clock - and a great tutorial - thanks so much for sharing! Thank you so much for taking the time to leave a comment! Everyone single one makes me smile like this :DDDDDDDD! Hello and welcome to my blog Indiyvidual! I am Yana - book addict, globetrotter and, of course, ardent DIYer. Armed with paintbrush, screwdriver and other handy tools, I try to turn my shared flat a little more stylish one project at a time.